Every home needs a good encyclopedia of Word and Phrase Origins . This is the one in our house. It is a handy reference when you wonder how the phrase there is more than one way to skin a cat came into being. I looked up bought the farm this morning. Before you knew it I was reading Bodleian Library, poppycock, lollygagging and lose face to my breathless audience. If you assembled the right group of people – I like to call them word birds, but some say word nerds – (and I dare say some of you qualify, eh?) you could spend a jolly good time passing the book around, randomly reading an entry, laughing and talking about it. Add a glass of wine or steaming cup of tea, a plate of scones in the middle of the room, and you have the makings of a party I would want to host or attend. “Put the book down, Carol.” the once booming, still-strengthening voice of my husband brings me back to life. We have details to deal with. Each one on its own is minuscule, but combined they can a force to reckon with. Remember cleaning the grout? 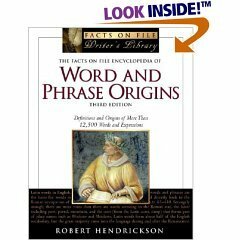 I’m easily distracted today, but word and phrase origins is one delightful distraction. This entry was posted in Uncategorized and tagged mylife, words by alivingpencil. Bookmark the permalink. Guess I’m a true *word bird* aka nerd because one of the best spend-the-night parties I had as a youngster was the one where we stayed up into the wee hours of the morning playing a dictionary game: spelling, definitions, derivations and the like. A book I just bought Gracie to read in the hospital is kind of along the same lines. Our Walden Bookstore is closing down and becoming Borders, so all books were 40% off and some were even 75% off. Anyway, this book is entitled something like, “Useless Information that you Always Wanted to Know.” Things like, George Washington’s teeth were actually made of bone, and Francels Gumm was Judy Garland’s real name. Just fun stuff to pass the time when you all have to wait for hours….How’s the packing coming along? @roseteacup – Cleaning the grout is just a metaphor for misplaced priorities and focusing on irrelevant details when stuff, BIG STUFF, needs to be done. We made great progress yesterday. It’s all coming together. Yay! @magistramater – Just as soon as I clicked “submit” I realized this. Sorry for the senior moment comment. Have fun on the other side of the pond.